The original name of the Dove Inn was the Western Hotel and it was a regular stop over point for travellers arriving by horse drawn coach and latterly the railways. Although the original stables are now gone, the original coach house can still be seen. 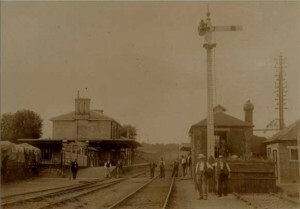 The railway between Basingstoke and Winchester opened on 11 May 1840 – and was the final section of the London and Southampton Railway to be completed. Prior to its construction, all of the traffic between London and Southampton was carried by eight stage coaches, four wagons per week, and one barge weekly on the Basingstoke Canal! In fact, the railway should never have passed through the Dever Valley. The shortest and most economical route from London to Southampton was via Guildford and Alton. But following much lobbying by the merchants of North Hampshire against that plan, a longer route was chosen – passing through Dummer and East Stratton. However, the line was eventually built through the Dever Valley on the instruction of the Chairman of the London & Southampton Railway Company, Sir Thomas Baring, M.P. 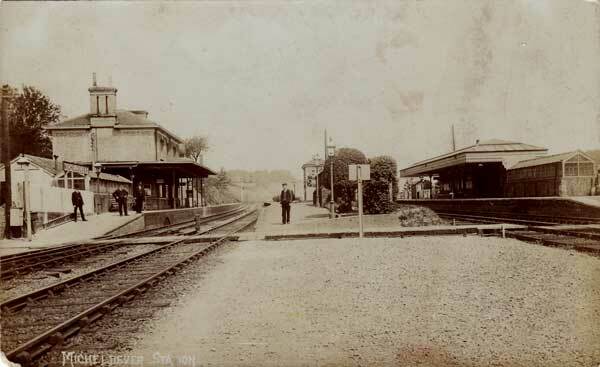 who lived at Stratton Park and had no wish for the line to be within sight nor sound of his residence! Francis Giles, the appointed engineer for the project, commented at the time… “The line was therefore carried through a barren and desolate country, where the soil was so valueless, that the landowners were glad to get rid of it at any price. The 18¾ miles of railway between Basingstoke and Winchester was the most difficult section of the whole route to construct. If it had followed the existing contours, the northbound gradients out of the valley would have been be too steep for the engines of that time to cope. To maintain an easier grade, four tunnels were built together with an embankment from one side of the valley to the other, effectively forming a wall between Micheldever village and the neighbouring hamlets of Weston Colley and Stoke Charity. Over a thousand Irish navvies built this huge embankment across the Dever Valley and during this time, the railway line terminated at Warren Farm (just opposite the site where Micheldever Station now stands) where there was a turnpike to Andover, some ten miles away. The railway builders certainly took their planning seriously – it is a beautifully engineered line, climbing gently from London to Basingstoke then falling continuously for 22 miles at virtually a constant gradient of 1 in 252 all the way from Lichfield tunnel (two miles north of Micheldever) to St Denys, just a mile or so short of Southampton. In steam days this section was a real racing ground – with southbound services regularly tearing through Micheldever at over 85mph. The northbound run was a very different scenario as the engine crews, especially those whose trains had stopped at Winchester, really had their work cut out. There are many stories of heavy trains barely reaching 20mph as they struggled through Micheldever on wet days during the climb towards Basingstoke. Today, the gradient is barely noticeable – the only excitement being the occasional southbound train which is travelling too fast and overshoots Micheldever station during the autumn leaf fall season! Micheldever Station is some three miles from Micheldever Village. 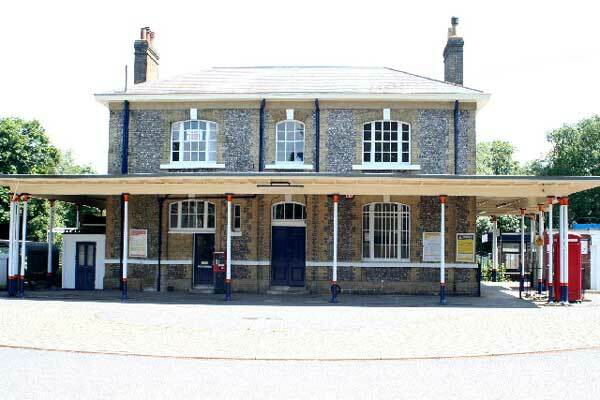 Known as Andover Road until 1856, the original station building, with flint walls and a hipped roof is believed to have been designed by William Tite (1798-1873). 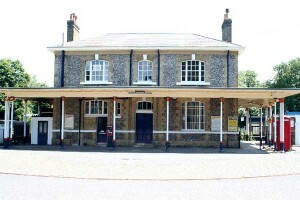 The building remains in use today (and is Grade II listed) but little else of the original station complex exists. Soon after the opening of the station in 1840, cottages were built on both sides of the railway to house local railway workers. Adjacent to the station a hotel was also built – known as the Western Road Hotel. It still stands today – as The Dove Inn. The settlement grew into the current community of Micheldever Station. The original four tracks through the station were reduced to just two in the late 1960’s, with an island platform now housing just a small modern waiting room. The signal box was demolished when the track layout was rationalised. However, four tracks still remain on the embankment at Weston Colley and are used daily to allow passenger trains to overtake the heavier and slower freight trains. 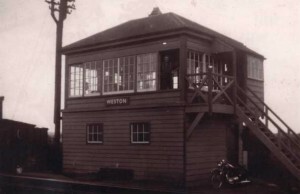 The Weston signalbox (pictured) was closed in the 1960’s. Interestingly, Micheldever has always been the most remote station in Hampshire – the only stopping point on the 18¾ mile stretch between Basingstoke and Winchester. 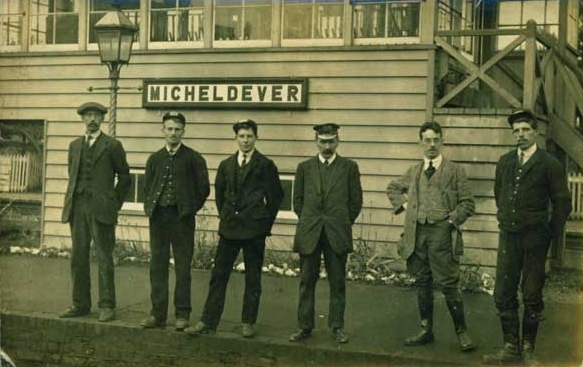 A major development of Micheldever Station itself took place during the Second World War. In June 1943, the Southern Railway was asked to assist the war effort. A total of seventeen sidings were built and became home to an Ordnance Emergency Depot, staffed by hundreds of soldiers. Micheldever Station soon became known as ‘the Woolworths depot’ thanks to its ability to provide virtually anything that could possibly be required by the military. A shed, over 2,000 ft long was built to house the depot. orders for stores received by late afternoon were packaged and left the depot by train that night and often reached Normandy the next day. Another essential supply service was also focused at Micheldever during the war – petroleum, oil and other lubricants. Over 18,000 gallons were stored in the tanks dug into the side of the railway cutting at Micheldever Station. It is rumoured that oil was then pumped through a pipeline that ran alongside the railway track to the coast and across to the Isle of Wight. From there it was pumped under the English Channel to the site of the D-Day landings. Known as PLUTO (‘Pipeline Under the Ocean’), oil could theoretically be pumped directly from the south coast to the far shore, thus incurring none of the risks or capacity problems of using shipping. It is believed that a flexible pipeline system, laid underwater from rolling drums, was developed from 1942. There is continuing argument over whether PLUTO actually met its potential, with some sources claiming that no fuel was ever pumped through. The Ministry of Defence has been unable to confirm or deny that PLUTO actually ran alongside the railway track. What is undeniable is the fact that Micheldever Station, with its “Woolworths”, made a significant contribution to the success of the D-Day Invasion. Although the line has always been an important and busy link to the South Coast, the service provided at Micheldever has always been frugal – Bradshaws 1922 timetable shows just 11 northbound services a day calling here. By the mid 1960’s this had only increased to 12 – and with only 5 of these actually going to London it was simply not possible to commute sensibly to the capital until the line was electrified in 1967. Things have improved a little over recent years, but the 2011 timetable still only shows 20 northbound services on weekdays, still sparse considering that almost 100 trains actually pass through each way every weekday! 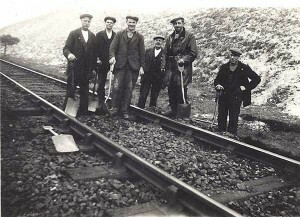 The railway was the last remaining mainline in the country to be worked by steam traction with the services finally giving way to electrification on 9 July 1967. The transition attracted enthusiasts from all over the country – with the result that the last years of steam are well documented and photographed (Winchester library is a wonderful source of pictorial and written history of that time). The use of steam traction until the late 1960’s did little to promote speed and efficiency – with the average journey time from Waterloo to Southampton taking around 95 minutes for the 79 mile run. After electrification, journey times were finally reduced to a standard 70 minutes for the hourly expresses. It’s interesting to note that while the service frequency has improved over the last 40 years the fastest journey time today from Waterloo to Southampton is…. only 71 minutes! Passenger numbers during the 1950’s and 60’s were low – and the station was threatened with closure by Dr Beeching. Fortunately, it soldiered on following electrification and one could argue that it was probably saved from complete closure by the threats of the Eagle Star New Town development. More recently, traffic has increased considerably… In 2005, just 58,000 passengers used the station. This had risen to 125,000 in 2010 – and the station during the morning and evening rush hours is a busy place. Of course, buying a ticket can be a challenge, as many regulars will know….! “Last Sunday a dreadful accident occurred on the London and South Western Railway. 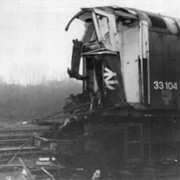 The engine of the train which left Nine Elms at ten o’clock in the morning, was, from some cause or other, not ascertained, thrown off the rail, when running through the cutting within 50 or 60 yards of the tunnel at Waller’s Ash, about five miles from Winchester, and Armstrong the driver and Chapman, the stoker, were instantaneously killed. One of the passengers, a lady, had the toes of one of her feet crushed, a gentleman was wounded in the leg, and a few others escaped with slight bruises. They were conveyed to Winchester in a wagon belonging to Mr. Pain, of Borough Farm, who promptly rendered every assistance, as did Mr. Dear, of Weston, and others near the spot. Among the passengers in the wagon was the Earl of Dundonald, who fortunately escaped unhurt, though seated in the carriage next to one which was knocked to pieces by the concussion”. Despite extensive investigations, the cause of the accident was never discovered. 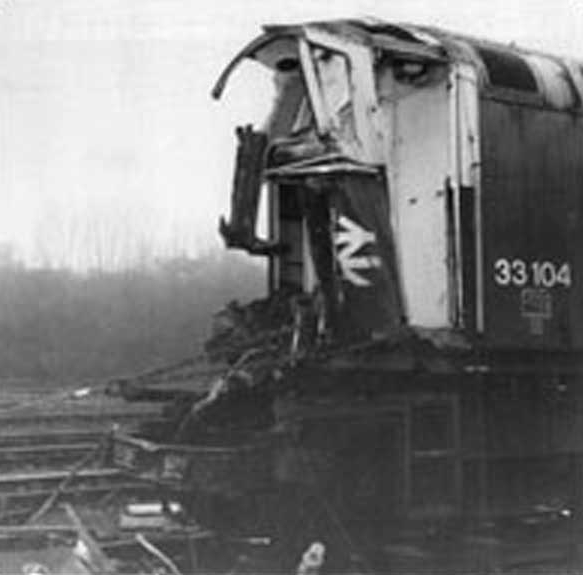 Much more recently, in January 1985, a diesel locomotive crashed into the stationary coaches of a passenger train between the two Popham tunnels (just north of the station). The passenger train had struck a minor landslip and was waiting for help with the diesel being sent to provide assistance. It appears that the driver of the diesel was unaware of the exact whereabouts of the passenger train and crashed into it in the darkness. Fortunately, no-one was seriously hurt.